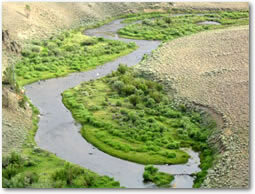 Day fishing is offered in the Wind River Valley to the streams adjacent to Lander, as well as to a few lowland still waters. Local angling is quite varied, but one can count on solitude, as these waters have not become as famous as many western rivers. 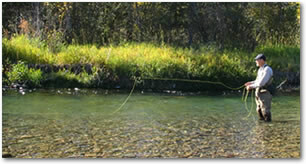 We do have numerous small streams with outstanding fly-fishing. We also offer float trips on the Bighorn River near Thermopolis. These streams are intimate and do not intimidate, no matter what your age. Instruction has become a natural part of these fishing experiences. Fishable streams can be found from March into November. Local runoff usually occurs in June, but we do have options even then. A great time in beautiful western scenery is the bonus. A lunch is furnished on all day trips. Our waters include the Wind River, Bull Lake Creek, North Fk. Popo Agie, Middle Fork Popo Agie, Little Popo Agie, and the Sweetwater River. 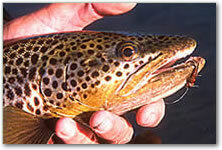 Come and experience our amazing, leaping brown trout and incredible hopper fishing! Click here for an equipment list in pdf.